Currently, there are some legislative proposals that will impact educators. There is a proposed change of governance in education. In the HF1079.0 Teacher Licensing and Standards bill in Article 1 Sec. 21 Transfer of Powers, “the Professional Educator Licensing and Standards board shall be considered a transfer by law of responsibilities of the Board of Teaching and Minnesota Department of Education with respect to licensure and credentialing of teachers and school personnel to the Professional Educator Licensing and Standards Board for purposes of MN Statutes, section 15.039.” This is also in the Senate bill SCS0004A-4 Article 1, Section 19. MDE’s responsibilities regarding school administrators is to be transferred to the Board of School Administrators. Student teaching may look different. Year-long student teaching experiences are included in proposed legislation. This may create hardships for teacher candidates, however. The specific rules on the implementation of this would be set by the proposed PELSB – Professional Educator Licensing and Standards Board. Tiered licensure is part of both bills. Both bills propose allowing untrained teachers in the classroom, which may address the teacher shortage, but may not provide the best education for our learners. Tiered Licensure begins at line 23.7 in the Senate bill. Tiered Licensure begins at line 33.7 in the House bill. There is much more to consider both at the state and national levels. This is just a short summary of MN proposed legislation. Find out what is happening in your state, your nation. Be informed. We will try to be. Representative Sondra Erickson, Chairperson of the House Education Innovation and Policy committee and lead author of House File 140. Consider contacting your legislative representatives to share your support and concerns. It is our responsibility to be engaged citizens. It is a choice, however, so you decide. Enjoy our freedom and make the most of it each day. Stay Calm & Be Engaged! What?! was all I could think of at the moment. Actually, I think what actually flew through my mind was “I will tell you why so much drama, guy – I am about to jump – no wait, you just pushed me over the edge, and I need to remember not to burn my hands on the way down or hit the cliff wall or the group of teacher candidates below chanting “Dr.V, Dr.V, Dr.V…” And now that I actually think about it (post-zip-lining so perhaps a bit delayed) I have three kids at home who call me mom, and I don’t think I actually signed on for this when I went to “teacher school” back in the day and…Wait, I am on the ground and the teacher candidates are cheering… I knew I could do it! I am so cool! I am like snoopy-joe-cool-cool. Yup – that’s me.” Okay –so maybe I lost you in all the drama, but that actually leads me to our point…you were wondering if there was a point at this point, right? Well, there is. A little bit of drama can help us get that final push out of our comfort zones and try something we might not normally do. A little too much drama, however, can wreak havoc on our plans and lives. If I would have become completely flustered, I may have started crying, which would have caused the gentleman worker to jump off the cliff himself, or it could have caused me to go too quickly and forget the instructions, causing me to burn my hands something horrible. Or I could have fallen to the ground screaming and scarred my students irrevocably – wait, does that happen anyway? Hopefully not…. Sometimes we find ourselves surrounded by drama queens. Maybe at times we find that we are the drama queens. What is important here to remember is to acknowledge the drama for what it is, know that some can be healthy, too much can be damaging, and sometimes we just have to leap. Do what is right and follow our hearts – no over-the-top drama needed but a little is okay. Our own advice, don’t let the drama get the best of you and ruin your story. Passion is great, but too much drama can damage the outcome. Hope for the best, scream a little if necessary, and give it a try. Sometimes you just have to let it go – and enjoy the ride. It has been one of those weeks. You know the kind?! The kind with a schedule so jam-packed full that you wonder on Monday at dawn how you might make it to Friday at sunset? This week was filled with responsibilities, activities, and life. To be clear and frank (although we never know who Frank actually is) – it was an incredible week on campus. It is Homecoming week! If you are part of the festivities, you know what we are talking about! If you remember the festivities from years gone by, you know what we are talking about! Homecoming is coming home. It is time to celebrate the past, present, and maybe even the future. Homecoming is about celebrating successes and reflecting on challenges…and having some fun! Our homecoming week was especially fantastic because we had a special teacher candidate return to campus after being away for a year. Who is she and where has she been? She is Chelsey Herrig, and she is located in Washington D.C. serving as the National Education Association (NEA) Student Program Chair of NEA. Ms. Herrig is entering her second year of the two-year limit in Washington, D.C. She is making us proud with her leadership endeavors. She is taking up the “Degrees Not Debt” campaign and bringing a level of awareness to the nation to improve the state for teacher candidates – future teachers – future NEA. The student program serves approximately 60,000 teacher candidates and the NEA serves approximately 3 million teachers. When sharing about her adventures over the past year, Chelsey shared with our teacher candidates who attended her speech that attending one local EMSP meeting changed her life. She became a member, became engaged, became the local chapter President, and is now the Student Program Chair for NEA. She is quick to note that she is more than the face of NEA; she is the voice and action; she is active and engaged and ready to take on a good cause in the name of learners and teachers. 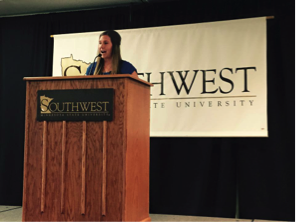 The Southwest Minnesota State University Education Minnesota Student Program (SMSU EMSP) chapter is still active on campus, and under new leadership, Wilson Ebner, chapter president, who helped organize Chelsey’s coming home event. The SMSU EMSP is involved in community events, including: Relay for Life, Scholastic Books Fair that raises funds and books for others, and reading to students in schools during special reading weeks such as Read across America. The student-driven programming provides teacher candidates with opportunities to focus on professional development, including resume building, networking, developing the teacher’s toolbox of strategies, and assessment frameworks. Ok – so where are we going with this you may find your inner monologue questioning. What is the moral of the story? Get involved and make “home” proud! It is up to you to make the world the place it needs to be. Oh – and have a blast at homecoming! “…and make good choices” as Dr. V. and Dr. C. suggest at the end of the week to the teacher candidates. As we strive to do more each day in our careers and lives, we were recently reminded, what we really need to do – is to be more. We can allow our days to fly by with schedules full, but what does it mean if the days mean nothing at all but items to check off the list? This past week the NSIC – Northern Sun Intercollegiate Conference met for the summer annual meetings. We gather together to consider what has passed – to celebrate successes and to move forward together to strategically plan for future successes. We are an optimistic group! 🙂 By the way, it happens to be the best NCAA Division II conference…not that I am biased! At the Honors banquet, we celebrated the Willis R. Kelly Award recipient, who is the top female scholar-athlete in the 16-school conference. This award is based on a combination of academic and athletic accomplishments. But really, it is so much more. The faculty athletics representatives in the conference highly consider leadership and community service attributes in this decision. 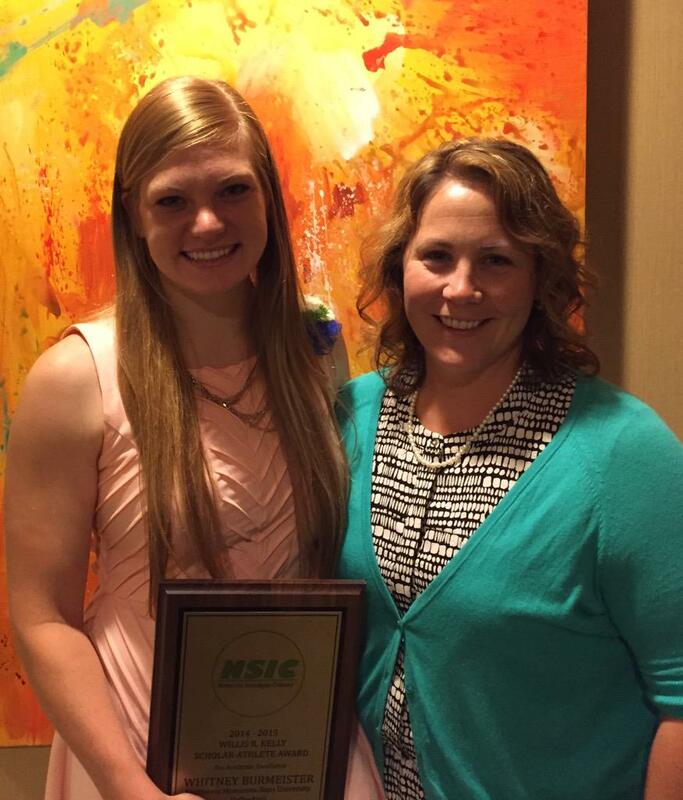 Whitney Burmeister, who will be a senior at Southwest Minnesota State University this fall, was selected as this year’s Kelly award winner. When I asked Whitney to share about herself, one of the highlights for her was being a class notetaker for other students on campus. She shared “it may seem minimal to others, but I love that I can help someone by taking notes for them if they need assistance.” She is also actively involved in the “It’s A Slam Dunk, Don’t Drive Drunk” campaign on campus as well as serving as the SAAC – Student-Athletes Advisory Committee serving as the secretary and working for the IFO – Interfaculty Organization office. 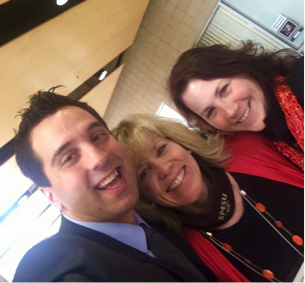 (Working with faculty across campus is no small undertaking!) Whitney excels in the classroom as an Exercise Science major and on the court as a key volleyball player. She grew up on the farm milking cows and knowing what work ethic truly is in life, sport, and school. She truly is an outstanding student and outstanding athlete. Moreover, she is so much more. We share this today because our goal for all of us – is to be so much more. We aren’t “just” this or that. Collectively, when we care for others, we are more. Our goal is that we continue to move forward and pay it forward. Let us consider this example and Whitney’s example of how we can be more for others. It isn’t who you are or what you do… but what more you do that counts. As teachers, leaders, citizens, it is our responsibility to be more. With the flurry of graduations this past month, you were bound to hear some reference to Dr. Seuss’ well-known poem “Oh the Places You’ll Go.” If you are like us, you love Seuss and you find yourself thinking about where you have been and where you will go. How did we get here? How will we get there? Sometimes the path is filled with joy and fun. Sometimes the path can be down-right scary and treacherous. Oh the places you’ll go if only… hmmm… how should we end that one? Dr. Seuss’ tells us, “Oh the places you’ll go with a head on your shoulders and shoes on your feet.” So now let’s think back to “Oh the places you’ll go if only” – how should we end that one since we know we have a head on our shoulders and shoes on our feet? There are moments we are unsure of the answer; we just know to keep thinking about it and trying new things. Have a little faith and believe. We cannot live by our regrets, we can learn from them and grow from them and move on from them. How often do we think or say or hear the words “if only I would have… But ” Far too often we judge ourselves based on what we have failed to do or own or be in the past. As we look to the future we need to remember that our mistakes are in the past, and they do not define us but guide us to make better choices in the future. This summer – take time to smell the flowers. Literally. Life flies by and missing the flowers just won’t do. Do something for someone anonymously. Volunteer regularly without expecting thanks. This is different than the previous… join a group or organization to make you part of something bigger than you are alone. Write a note to yourself and tuck it away. For now. Decide when you will take out your reflection or words of advice. Is it a goal that you set and met? Is it a big birthday? Think of it as words of advice to follow from the person who knows you the best – yourself. Smile. It truly is contagious and makes everything seem okay – if only for a little while. That little while may be all it takes to look up. Journeys and places – peoples and faces… Where will your adventures lead you this summer? You decide on what the +1 for life’s adventures. Only you can decide. So whether you travel afar or just outside to the lounge chair, remember that only you can decide where to go and what perspective to have. So have a little faith and believe …and … Oh, the Places You’ll Go! What Happens When a Retired State Trooper Becomes a Substitute Para? Anyway, she shared that she was just finishing up a nine week substitute job as a paraprofessional. That made the ‘ole eyebrows shoot straight up! She was working with a few young children who needed a para with them because of possible seizures. She was also working with other children with special needs. Her stories brought some belly laughter and also a few tears. Educators beware…honesty is shared here and some of her words may offend you. “I’d rather go to a car crash site any day, than to watch a four year old have a full blown seizure. That was a tough situation to witness! I had just visited with this little girl about having to go back into the building soon, and she went to the top of the slide one more time, waved at me, then collapsed. Right there at the top of the slide. Teacher candidates…have a plan! If you are unable, for any reason, to climb up steps to get a student off the play set, have a plan. Who will you ask to help you? How will you get that child down? Having a plan in any type of emergency situation will prevent chaos later. Teacher candidates…what intervention ideas do you have up your sleeve for students with exceptionalities? A Taser is not an option. A website that is a great resource for you can be found at www.interventioncentral.org. This website offers academic interventions, behavior interventions, and tutorial videos. It is worth a visit! Teacher candidates…be cautious of the teachers’ lounge. National Businesswomen’s Leadership Association (1987) reported that if you are in a positive mood and you walk into a negative place, it will take a mere 7 seconds to become negative yourself. Do not let that happen! Be the change agent in that lounge! One little girl the trooper/para worked closely with had gotten blue marker on her nose. It was the end of the day and this little girl did NOT like having her face washed so battles were picked, and the marker on the nose was left alone. When trooper/para took the little girl to meet her mom, she apologized for the marker on the little girl’s nose, explained the situation, and left it at that. The next day, trooper/para had to report to the Director of Special Education. The director explained that the parent had sent an email demanding that her daughter be cleaned up every day. Well, the retired trooper, not even thinking of the marker, asked, “I’ve never gone into the bathroom with her. How do I make sure she is cleaned up?” After finding out that the mother meant the marker NOT toileting help, trooper/para let the director know she had apologized to the parent the day before. When the director heard this, she stated she would take care of it. Teacher candidates—most parents are your allies. Some will complain now and then, however, for the most part, they want to be helpful. Remember, your students are number one in the eyes of their moms and dads. Parents just want the best for their children! Do your best, and remember QTIP when it comes to parent comments…Quit Taking It Personally! Teacher candidates—please remember you are the teacher. Your para is there to assist you in many ways, however, paras should not be doing your duties. Treat them respectfully, and, most importantly, thank them often! Do your job, teacher candidates, and do it well! 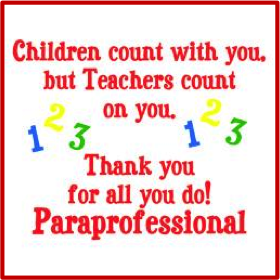 To all teachers and paras, we thank you for the extraordinary tasks you accomplish every single day. Thank you! Thank you for your hard work and dedication to all those children you serve! A command we often say to elementary students (and college students) is, “If you can’t say something nice, then don’t say anything at all.” If we all followed this rule, it might be a magical place… or just really quiet? Being the optimists that we are, we are going with the magical place. Join us, won’t you? 1. Have courage and be kind. Each day carries unique challenges. Some days it takes more of an effort to get out of bed like Anna in Frozen while other days we fly to our feet taking on challenges like Ella in Cinderella. Cinderella had to ignore the negative voices, take a chance and enter the ball solo with so many unknowns. Similar to this our teacher candidates need to have courage to enter that new classroom and set out to change the world – no small task. This does not have to be solo, however, if we break the isolation of teaching and collaborate with colleagues. We just need to follow Ella’s mother’s advice – “Have courage and be kind.” It is amazing how we could be the positive change we want to see if only we start. 2. Overcome the odds against you. A quirky Disney movie titled Bad Hair Day, depicts a typical teenage girl who thinks life is coming to an end because of a bad hair day. In the book, Chicken Soup for the Teenage Soul, Allison is a typical teenage girl who suffers from a hair loss condition called alopecia. When Allison was elected the president of her class, she began her acceptance speech with, “when most of you wake up in the morning and don’t like what you see, you may put on this t-shirt that says ‘bad hair day.’” Allison continued, “When I wake up in the morning, I put on this t-shirt that says ‘no hair day.’ This young lady learned to overcome the odds against her. 3. Take charge of your emotions. Teachers deal with sensitive students all day long. One minute that student may be sweet and innocent. Then, BAM…with the snap of the fingers that same student has a full blown temper tantrum. Inside Out is a cute Disney movie to be released in June that shows a mother, father, and daughter sitting at the dinner table, and inside their brains are little personified emotions trying to be in control. The daughter is trying her hardest not to have an outburst, but, the emotion escapes her. Now there are consequences to pay. If she would have just taken charge of her emotions. 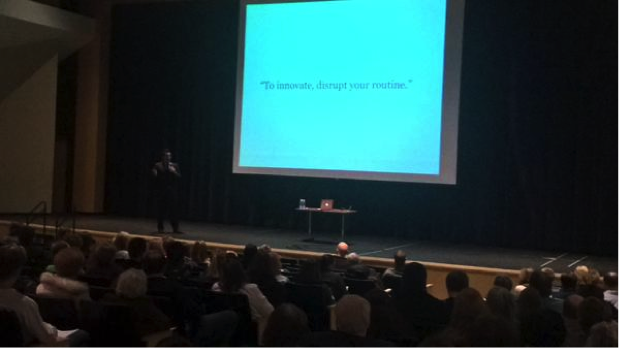 When teaching and dealing with unruly students’ behaviors, take charge of your emotions. 4. Make a friend for life. Do you have a best friend? Why is he/she your BFF? Would you choose a friend just by how he/she looks or what he/she wears or what kind of stuff he/she has? 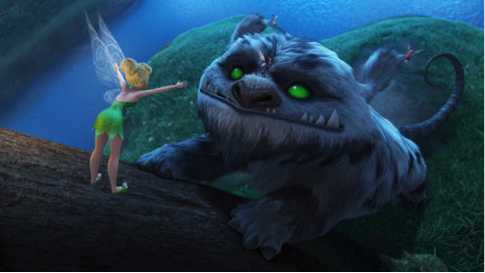 In the released DVD movie, Tinkerbell and the Legend of the Neverbeast, Fawn the animal Fairy, befriends the very large, mysterious, kind of homely Neverbeast. Fawn stays true to her heart, trusts her instincts, and helps the others take note of the Neverbeast’s good side. Fawn doesn’t judge the book by its cover. Find that special someone, a colleague perhaps, and make a friend for life. 5. Embrace opportunities to explore uncharted territories. The movie trailer for Tomorrowland begins with the following quote: “What if there was a place…a secret place where nothing was impossible? Miraculous place where you could actually change the world? Ya wanna go?” Would you embrace this opportunity or would fear overcome you to cause you to run away from it fast? Let us share a secret with you about this secret place…it exists and it offers new opportunities every single day. Where is this magical place? It is the classroom. Each and every day presents new opportunities. Teachers…you can change the world—one student at a time. Look for this new movie in May. Have courage and be kind so you can overcome the odds against you. Take charge of your emotions and find that special someone to be your friend for life. Together, embrace opportunities when they arise then go out and change the world, one day, one person at a time. Do you have any fairytale lessons to share with us? Engage Learners: We need to run away from constant “mind your own business learning.” Educators must engage learners. 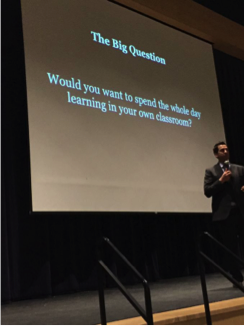 The big question George had for his audience was “Would you want to spend the whole day learning in your own classroom?” Boom! Self-reflection at its best! Go on…answer that one very honestly! Whether your environment is a classroom or office setting – consider it and walk a mile in another learner’s shoes. Whatever your answer, just remember to engage your learners – your people! Disrupt your Routine: What are you changing in your routine to innovate? Just this last week in a Junior Achievement lesson, we discussed innovation with 4th grade students. Innovation is to improve upon something. We aim to do this in our work and play each day. Thinking about our daily routines, what can we do to change it up just a bit? No one wants to be bored in the classroom – teacher or student. 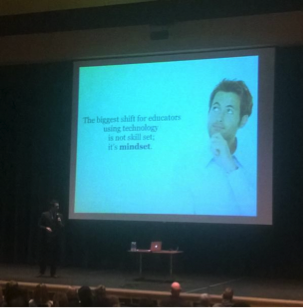 Consider integrating technology that will change the teaching and learning process. Innovate to further create and be better than yesterday. We owe our ancestors a great deal for the lives that we have today. Let’s not disrespect them by becoming stagnant. Get out of your comfort zone and try something new or take a different approach today. Change your Mindset: It’s not about skillset, it is about mindset. Change your thoughts and way of thinking and change the outcome. According to Dr. Carol Dweck, author of Mindset: The New Psychology of Success, “school cultures often promote, or at least accept, the fixed mindset. They accept that some kids feel superior to others and feel entitled to pick on them. They also consider some kids to be misfits whom they can do little to help” (p.169). Okay – maybe we are getting off topic here – we will revisit bullying another blog, but think about it. Mindsets shape how we think and who we become. Change yours and see the world from a different perspective. It does not have a to be a world where it is you v. technology. Embrace Technology: We’ve always told our teacher candidates that technology is one instructional tool they can use while teaching. So when George said “technology is more than just a tool” we paid attention. He went on to explain that technology is a way of life for the kids of this generation so we should at least try to understand their world. George’s dad, who could not read or write very well, started to use email. It changed his world. His dad also started to Skype. This dad wanted to be part of the technology world because that is where his son was. Shouldn’t we do that for our students too? google images – because you don’t want to see us do this! We could relate. We’ve yelled the very same thing to our own kids when they’ve become frustrated on the court or the field or the course. When we see their attitudes starting to quickly fade from positive to negative, we mom’s yell “SHAKE IT OFF!” And maybe even add a “NOW” to the end. 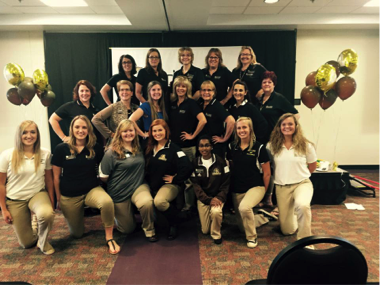 Sometimes our “mom” personalities kick in for our teacher candidates at SMSU. 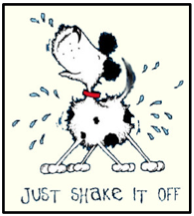 There are times when our teacher candidates need to “SHAKE IT OFF” – this is true when their field experience placements are received a little bit late, or when learning about the edTPA requirements, or when they did not pass one of their MTLE exams, or when trying to figure out how they will fit in the 45 lab hours that are due at the end of the semester. Breathe – Take a few deep breaths. Inhale for a count of eight then exhale for a count of eight. Get your oxygen flowing to help clear your head! Refocus – Change your perspective. Only you can change you. Focus on the positive not the negative. Begin again. Take Responsibility – You are responsible for no one but yourself. Stop blaming others, and stop complaining to others. Fight – Adopt an attitude of a soldier. Be courageous, make some sacrifices, and do the best you can to fight for great results on whatever tasks you are given.